You probably know by now, Curlys is your go-to source for all of your carpet repair, carpet stretching and carpet cleaning needs. But did also you know Curlys is your one-stop shop for new carpet installation? 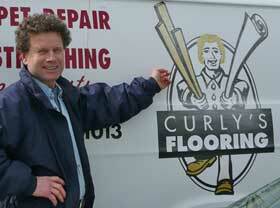 Now, Curlys does it all! Sadly, there comes a time in the life of all carpets where no repair, re-stretching, or re-cleaning can bring it back to life. But saying goodbye to your old, worn-out carpeting needn’t be a traumatic episode. Curlys Carpet experts will install beautiful, long-lasting wall-to-wall carpet quickly and efficiently. And, we’ll do it all at a very affordable price that’s sure to bring a smile back to your face! At Curlys Carpet, we’ll work with you as your very own carpeting consultant, assisting you in picking the right carpet style, colour, texture, and pattern. You’ll browse through our dynamic and extensive assortment of carpets and pick the carpeting that’s perfect for your specific needs. And, you can rest assured Curlys scours the entire region looking for the best quality carpeting, at the best possible value. Then, once you’ve decided on the right carpet at the right price, our highly-skilled team of carpet installers will ensure the new carpeting is completely and meticulously installed. Our carpet installers are real pros, experienced in the nuances of proper installation, using the latest state-of-the-art equipment and tools; all designed to get the job done right…on-time and on budget. That’s Curlys guarantee to you! So if you’ve come to the conclusion that it’s finally time to say ‘good-bye’ to your old and tired carpeting or flooring, let Curly’s deliver and professionally install the new carpeting of your dreams! For fast response, call us today!